Karen Elizabeth Walker CNZM is a noted New Zealand fashion designer. Living with Cannibals and Other Adventures, Dough and Dynamite, Liberal and Miserable, Karen in TV Land, Queenie Was a Dog, Victory Garden, Karen to the Rescue, and Young, Willing and Eager. 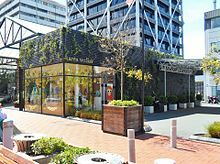 Walker began her fashion label in 1987, and opened her first store in Newmarket, Auckland, in 1995. She began selling to Barneys New York in 1998, the same year she showed her first runway collection. In late 2011, she signed a partnership with United States-based retail chain Anthropologie. She has designed clothes worn by Björk, Sienna Miller, Natalie Portman, M.I.A., Alexa Chung, Beth Ditto, Michael Haneke, Liv Tyler, Rihanna, Claire Danes, Zooey Deschanel and Jennifer Lopez. She designed clothes worn by Kate Winslet in the Michel Gondry film Eternal Sunshine of the Spotless Mind. 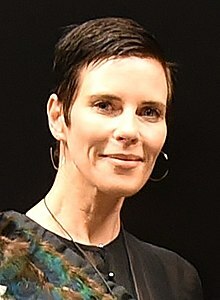 In the 2004 New Year Honours, Walker was appointed a Member of the New Zealand Order of Merit, for services to the fashion industry. She was promoted to Companion of the New Zealand Order of Merit, for services to fashion design, in the 2014 New Year Honours. In 2009 Walker received a World Class New Zealand Award  in the Creative category. ^ Ryan, Holly (10 August 2015). "Karen Walker: 'Listen to that little guy in your head'". New Zealand Herald. Retrieved 24 March 2018. ^ "Karen Walker hits the US, put homewares into Myer". Fashion Source. Melbourne. 19 January 2012. Archived from the original on 29 November 2014. ^ "As Worn By". Karen Walker. ^ a b "Kelly Osbourne Wows MTV Wearing Karen Walker". Scoop. 5 June 2003. Retrieved 7 September 2012. ^ "New Year honours list 2004". Department of the Prime Minister and Cabinet. 31 December 2003. Retrieved 12 January 2018. ^ "New Year honours list 2014". Department of the Prime Minister and Cabinet. 31 December 2013. Retrieved 12 January 2018.